Any trick to putting a plastic bead on a hook? The easiest solution would be to partially or completely flatten the hook barb. You may have to get beads with a bigger dia hole. Check out the metal beads used by fly tiers. They have a larger dia hole and are counter bored on the back side to allow them to go around the bend of the hook. This would be a PITA to do. One other possibility is to make a bead using colored hot melt glue using a rotary fly tying vice. 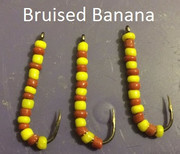 I've done this to make egg flies for salmon fishing. Good luck. Have to keep turning until sets up. This may be a stupid question, but what is the point of the bead and/or plastic sleeve on some of the ice fishing hooks? I've never figured it out and generally just break them off. I don't know if a Lazy Larry's EZ Bead would work or not for what you want to do - used typically for bead fishing of salmon and steelhead. These beads are sliced halfway thru so you can peg them to your fishing line without having to cut your leader. It is suppose to mimic fish eggs. I believe some of the great lakes have a really healthy perch population that will feed on red fish eggs.....I think the eggs might be from trout....not sure. I tried them in northwest iowa and in a few lakes in SD & MN........didn't work at all. I'm pretty sure they have an area they work and it isn't around here. What kind of bead on what kind of hook? 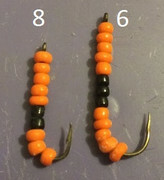 A plastic bead on a single hook like the beaded spoons have or one in the middle on the bottom of a treble? I've done a number of the latter quick n dirty. Heat the hook (carefully, don't destroy the temper, I use a hotplate) and when it's hot enough just press it onto a plastic bead. In most cases the melting plastic flows around the hook and locks it in. 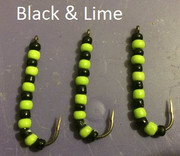 My experience has been with trebles but I expect you could do it with a single hook too. Epoxy can work but the 5 minute stuff is the worst of the epoxies in water. The longer the cure (generally) the better water resistance. Now, a little investment in some UV cure resin and a UV flashlight or (better yet) laser will cure your stuff very quickly and in the case of the laser instantly with maximum performance in water. Both flashlights and lasers can be had for < $10 on eBay. Resin runs 15 - 20 bucks for 4 oz. Pricey, I know but a little goes a long way, nothing is wasted in a pot and made for fishing if you stick with names like Loon and Solarez. Another q/d method: Make the hole in the bead big enough to slip on over the barb then use a line threader to pull a "right size" rubber band through the bead. Trim the ends. Done. I've made poor man's bobber stops like that. Just smash the barb, you don't need it anyways. Hardly ever lose a fish with them, about as often as with barbed hooks. They mimic some sort of nymph. All I know is that the fish love them in shallow mud bottom areas. I make and sell beaded spoons with a hard bead on the hook. To be honest on my personal lures I use a Jensen egg. It’s a soft rubber soaked ball in anise oil. interesting kevin 23, do you use any scent on them at all? No, it is purely a reaction bait.